Not only are Candy Centerpieces beautiful, they're yummy too! So, you've been racking your brain to decide what kind of unique centerpieces you want for your wedding reception, birthday party, bridal or baby shower, anniversary party, sweet sixteen or whatever you are celebrating, look no more, because you have landed on the right page. It's true, they're elegant, they dress up any room and they are easy to make. Additionally, they are cost effective as they are less expensive than fresh flowers and can also serve as your favor when your affair is over. 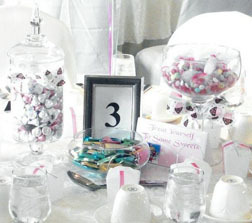 The above candy table decoration was created by using a tall clear vase. You can fill the container with clear plastic wrap, marbles, stones or opalescent colored paper. Then cut a piece of Styrofoam and carefully hot glue gun it to the rim at the opening of the vase. 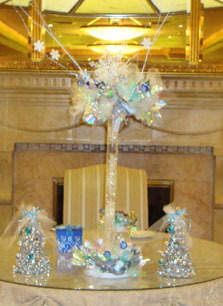 The rest of the centerpiece creation is up to you and how elaborate you want your centerpiece to be. You can place lollipops, tulle, snowflakes, heart forms, painted twigs, silver stars shooting out of the middle or whatever coordinates with your theme and or course, your color scheme. For the base of your centerpiece, cut a round piece of Styrofoam and wrap it in tulle. Then push your lollipops or other candy on a stick into the tulle. This unique candy centerpiece is put together using eight 1.5 oz. 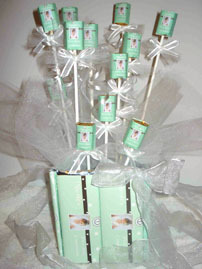 personalized candy bars, 12 chocolate nuggets, ribbon and sticks to hold the candy in place. If you prefer, you can place additional candy in the center of the arrangement. For those of you who are talented and on a budget you can practice making this centerpiece in the colors that coordinate with your theme. This Centerpiece is great for people who can't decide which candy they want to put into their centerpiece because any candy will work in this clear container. 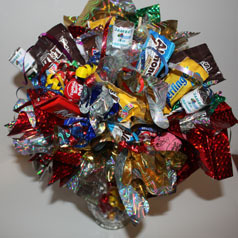 How about the above candy centerpieces as a mix and match? A closed container with lid for candy kisses, an open bowl for chocolate covered mints and a large Champagne glass to be filled with an assortment of different candies. You may also like to have chocolate rose lollipops on a stick. Have the rose match your color scheme and wrap each rose bud in clear plastic. I prefer all candy to be wrapped, just in case your guests haven't washed their hands prior to dipping their hands into your scrumptious candy dish. 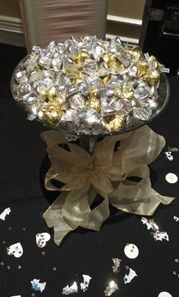 The below table decoration is definitely a DIY project that can be made ahead of time by purchasing a pedestal candy dish, silver and gold kisses and gold ribbon. Wrap the stem of the candy dish with pretty ribbon and then create 6 - 8 loops and cut the edge of the ribbon as shown below. On the day of your celebration add the kisses and - there you have it! A beautiful arrangement that cost around $12. Candy Centerpieces are different and versatile. Don't forget to take a look at my other centerpiece ideas by checking out the links below. Go Here for Lots More Bridal Planning Ideas.